Like Chris, I long for an RPG that drops fantasy in favour of realism, that portrays astute sword fighting with weight, labour, and context—as an act that has meaning and not simply a set-piece determined by who can wind up with the most remaining hit points—and Kingdom Come: Deliverance looks like it could be just that. 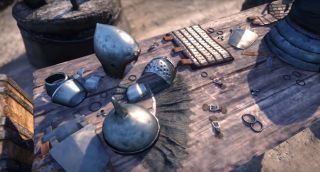 Admittedly, much of the leveling and open-world elements touched upon there does echo the likes of Fallout and The Elder Scrolls, however it’s also clear just how much research Warhorse has put into crafting this world and its mechanics—not least its extensive armour system. Armour allocation is comprised of 16 slots (weapons take up four) which are grouped into the following: six body slots of cloth, chainmail, plate, sleeves, gloves, coat/hood; four leg slots of trousers, chainmail, armour, boots; four head slots of coif, chainmail, helmet, necklace; and two jewelry slots—rings and spurs. Add all that to the fact you’ll need to keep an eye on your appearance as well as your armour’s durability (apparently shops won’t trade if your armour is bloodied, for example), the impressive sword fighting system, the fact that you can infiltrate enemy camps—à la Hitman—by donning looted garments, and the fact Dutch Courage is factored into all of this, and it seems Kingdom Come: Deliverance is shaping up rather nicely. No release date just yet, though, beyond the ambiguous “2017” noted back in May.